…and then, finally sensing the trap, he belatedly segued into a diatribe about how uniquely dangerous “assault weapons” are. It’s those shoulder things that go up – apparently just blundering near one is instantly lethal. 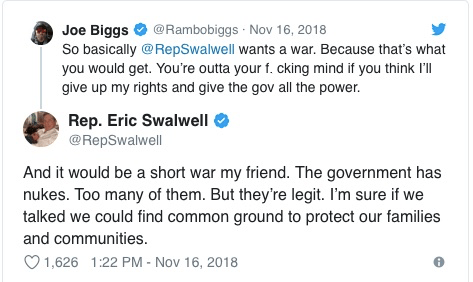 The funny thing about Swalwell, and I mean that literally, is that this is actually his version of toning down the rhetoric. Last year he was threatening us with nuclear weapons. Seriously! The question has been asked so often it’s become a cliché: Why are gun grabbers so violent? And, in the face of their very serious threats, do they really expect us to disarm? They don’t seem trustworthy.